Parkstone now has its own independent service chapel – offering an alternative to a crematorium funeral ceremony for people of any or no religious faiths. Ives & Shand Funeral Service in Ashley Road has taken the unusual step of building its own service chapel and Ministers from a range of faith groups attended a dedication ceremony to mark its official opening on Tuesday March 22. The move marks a growing appetite for non-religious and more personal funerals. Shane Watson, Manager of Ives & Shand Funeral Service, said: “Everyone is entitled to a personal and special funeral – many people don’t have a traditional faith and until now their only option has been to have a service in a crematorium. 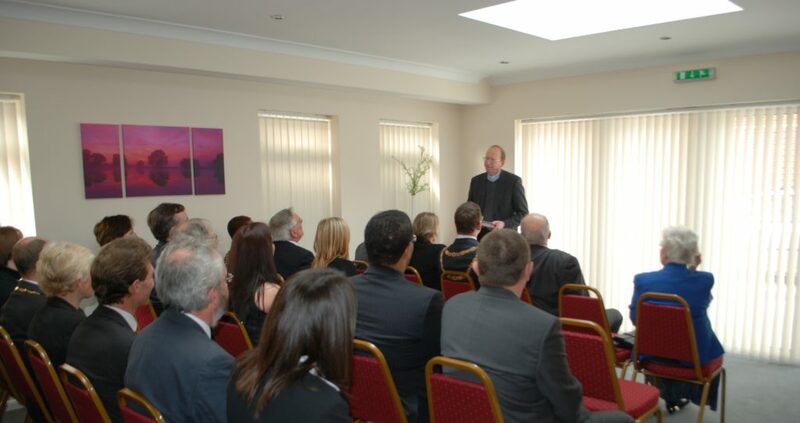 Our service chapel gives them more choice and can also be used for religious ceremonies. “There’s more choice in funeral planning than ever. When I started, oak coffins were standard – now, as well as wood, they can be made of willow, bamboo or hyacinth and people have much more influence over the content of their services. Now we’re going a step further by providing extra choice over venues. The new chapel will host up to 40 people and services can be conducted by family members, funeral directors, humanist ministers or religious leaders. Philip Blatchly, president of the National Association of Funeral Directors was among invited guests at the dedicated ceremony alongside Deputy Mayor of Poole The Reverend Charles Meachin and a special blessing was carried out by Reverend Jonathan Foster, Minister of St Clements Church, Parkstone.